The accompanying chart shows currency with the public as a percentage of money supply in the economy. In October 2016, a month before demonetisation, currency with the public was 13.3 percent of total money supply. That fell dramatically in the months following demonetisation but it is back at 13.5 percent now. If one of the purposes of demonetisation was to lower the proportion of cash in the economy, it has failed to achieve that objective. True, for some months in 2016 the proportion of cash holdings was very high, reaching 14 percent in June. But that was an aberration, as the chart shows. During most months in 2014 and 2015, the proportion has been a bit above 13 percent. Cash levels are now well above the 13.1 percent they were in March and April 2014. Cash with the public has started rising again in recent months, in the run-up to the general elections. 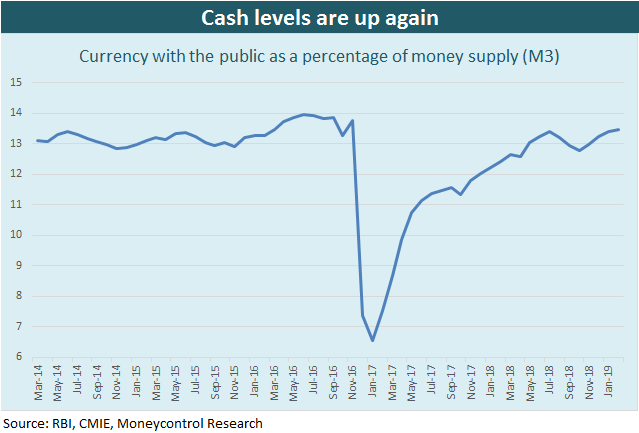 Indeed, as the chart shows, it has steadily moved up since last October’s level of 12.8 percent of money supply, no doubt the result of political parties using cash for election spending.